That’s like a restaurant posting a sign stating “As a courtesy to our chefs please be sure to eat everything on your plate”. 1. The onus is on the speaker to keep it interesting. I would stay as long as I believe it was in my best interest to stay. I would leave when I want to leave. 2. The speaker was already discourteous by starting late and loudly blaming “the person who was supposed to bring my presentation”. Why didn’t the speaker have a copy of his slides with him? When he started, he seemed to rush through the presentation and still went late. I’m not sure what his key message was. I walked away remembering nothing from his presentation. Perhaps I should have left before he started as a courtesy to me. 3. The event organizers were discourteous to the attendees in several ways. That included the 15-minute late start for the opening program; the lack of directions to the main stage, and hiding the coffee room - among other transgressions. 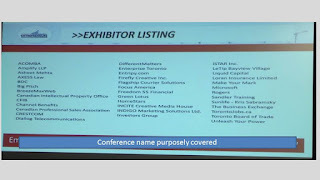 Hmm, imagine what courtesies the attendees might request from the organizers and speakers. Post directions and/or maps to the different rooms especially the main stage. Don’t place the exhibit booths on the other side of the curtain in the same room as the keynote presentations because it’s too noisy for everyone. Arrange proper lighting for the main stage. The dimmed chandeliers might be appropriate for a wedding reception but not for a business event. If the speaker is not using slides, blank the projector. 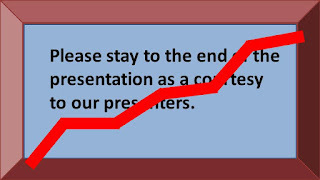 Don’t flash your promotional slides during the speaker’s talk. That’s distracting and discourteous to the speaker as well as the audience. 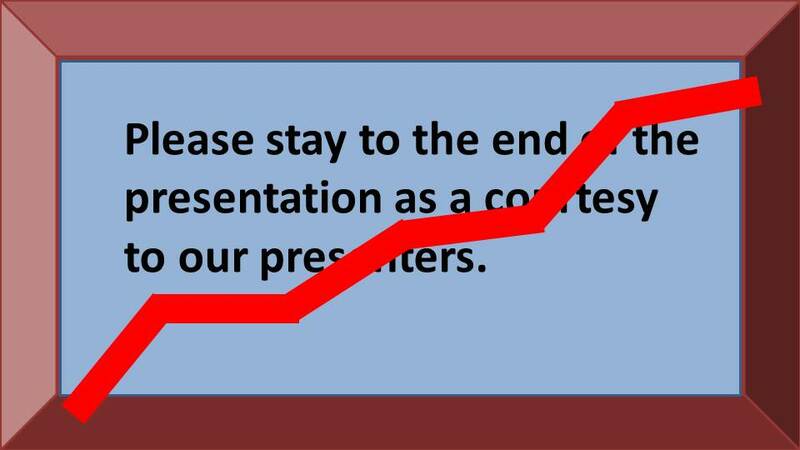 The promotional slides that you show between speakers can be effective if the audience can read them. 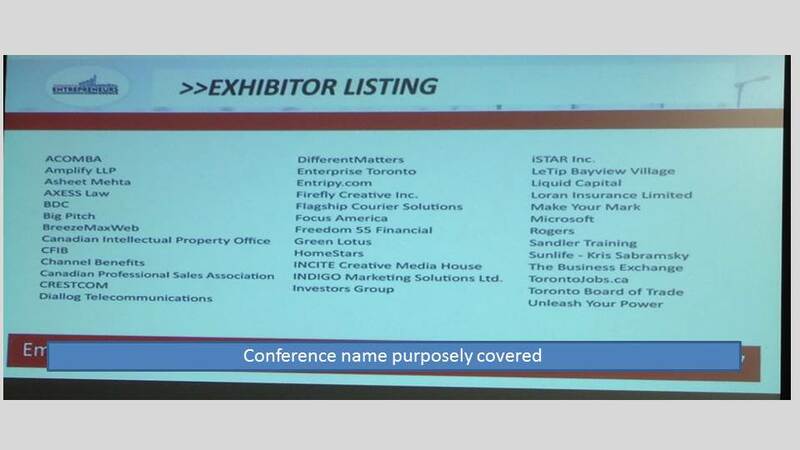 There’s no point in listing all 30 exhibitors on one slide. Consider splitting that list across three slides. 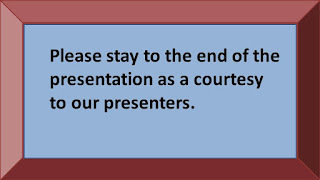 Clarify the start and end times of the presentation with the speaker and MC including speaking time and question period. Allow the speaker to manage how they use that time. Silence the room before introducing a speaker. When conveying instructions for a networking activity state the directions clearly and indicate how you will signal the end of the activity. 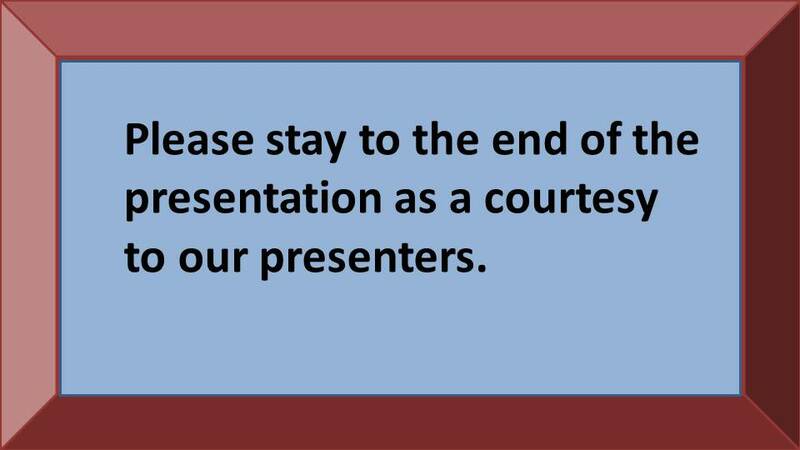 Confirm the ending time with the speaker before the presentation starts. Be in the room with all your materials well before it’s time to speak. Prepare and rehearse your opening. Prepare and rehearse your closing. Prepare and rehearse your presentation so you don’t need to read it from sheets of paper or your slides. Use slides if they help illustrate your message. If they don’t, then don’t use them. If you plan to use the slides for your notes, see previous point. The audience should never feel trapped. They’re attending the program for an enjoyable experience and/or to learn insights and capture useful ideas. Telling them to stay in their seats like compliant kindergartners doesn’t enhance the experience or the learning. Naturally, the need to deliver rules like that suggests that the organizers believe that the speakers aren’t good enough to hold their audience. In my experience as a professional speaker over the past 20 years I’ve learned that the audience can vote with their feet or mobile devices. Often I openly invite people to leave the room whenever they want. I’d like them to attend but only if they want to be there. For that reason I ask the organizer to keep at least one door open so people can easily leave or enter the room while minimizing any disruption. That seems courteous to everyone. PS: You might be surprised to learn that all of these observations were gathered at one conference that I attended. What discourteous practices have you experience?